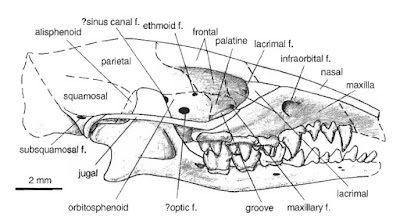 Reconstructed skull of Uchkudukodon nessovi, from McKenna et al. (2000). The Asioryctitheria are a group of small, probably insectivorous mammals known from the Late Cretaceous of Asia. Monophyly of this group is uncertain: Wible et al. 's (2007) phylogenetic analysis found them to be paraphyletic to modern placentals whereas Halliday et al. (2017) found a clade uniting Asioryctitheria with the contemporary Zalambdalestidae. [AAE01] Archibald, J. D., A. O. Averianov & E. G. Ekdale. 2001. 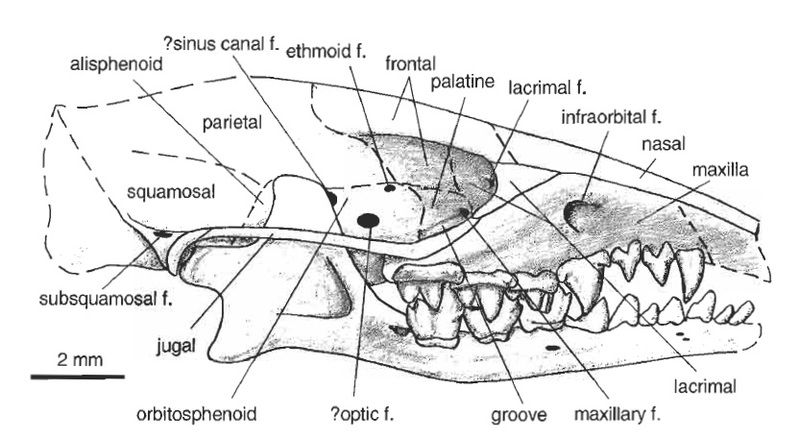 Late Cretaceous relatives of rabbits, rodents, and other extant eutherian mammals. Nature 414: 62–65. [FN03] Fox, R. C., & B. G. Naylor. 2003. A Late Cretaceous taeniodont (Eutheria, Mammalia) from Alberta, Canada. Neues Jahrbuch für Geologie und Paläontologie—Abhandlungen 229 (3): 393–420.